Let me say this upfront: There is an admirable popcorn-movie craftsmanship in Avengers: Age of Ultron, much of it due to the efforts of director Joss Whedon and a cast that is both easy-going and game. But I was bored stiff through much of the movie. Unlike other movies in long-running franchises, including the various James Bond films over the years, Age of Ultron felt like a middle chapter in an ongoing saga rather than an event unto itself. Partly this is a question of the stakes: We know that the main characters can’t die, not only because some of them are gods (in Thor’s case) but also because they are committed to additional Marvel movies, either standalones or future Avengers mashups. But that’s only part of the issue — we know that 007 ain’t gonna expire, either. Individual Bond films, however, feel like self-contained entertainments. There are recurring characters and narrative tropes, but you can watch them out of order without any risk of befuddlement. Not so the Marvel movies, particularly Avengers, which increasingly seem to be designed as Rube Goldberg contraptions meant to accommodate an ever-expanding Marvel Universe and its multiplying spinoffs. Age of Ultron even shoehorns in a cameo with Josh Brolin’s Thanos to presumably bring last summer’s Guardians of the Galaxy into alignment with the more Earth-bound Avengers heroes. You know you’re in trouble when the Easter eggs are more compelling than the beats of the story at hand. 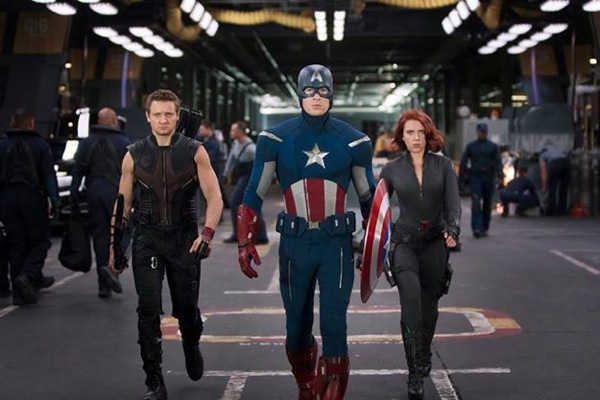 And because the Marvel Universe cast is so large, the screenwriters must work overtime to toggle between the various franchise stars — as well as introduce new villains, roll out (potential) new brother-sister Avengers Quicksilver and Scarlet Witch (Aaron Taylor-Johnson and Elisabeth Olsen), and give some screen time to Avengers currently without spinoff series of their own. In fact, Age of Ultron spends an awful lot of time on these superhero orphans. We get flashbacks of Scarlett Johansson’s Black Widow and even meet the secret family of Jeremy Renner’s Hawkeye. Much of this feels like narrative wheel-spinning — there’s a reason that these spandexed sidekicks don’t have their own movies, after all, as Renner underscored in his hilarious routine on Jimmy Fallon this week. And in this case, the filmmakers seem to be saving the good stuff, about the characters we know and love, for those heroes’ next standalone project. Imagine attending an NSYNC reunion concert made up mostly of Chris Kirkpatrick solos. In the end, I found Age of Ultron unsatisfying because the pleasures it delivers are almost entirely contingent on our memories of past films and our anticipation for/speculation about what might come next. It’s the blockbuster-movie equivalent of an above-average Wednesday episode of General Hospital, but not even the one where Luke and Laura get married.